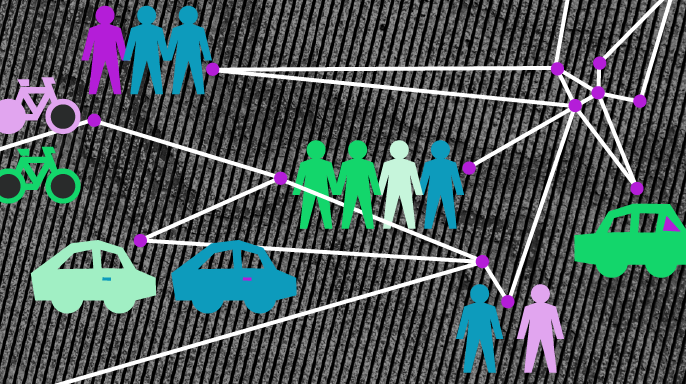 What is a “sharing economy” anyway? Statistics Canada recently reported that 2.7 million Canadians participated in the “sharing economy” between November 2015 and October 2016 – and spent $1.31 billion doing so. These are big numbers that are likely to grow significantly in the short- to medium-term. But what exactly is the “sharing economy”? All this imprecision can be confusing. The Mowat Centre has been grappling with how to define the sharing economy for a few years now. While our thinking is still evolving, we’ve developed an approach that we believe combines analytical rigour with a perspective that resonates with popular understandings of the term. Activities that involve the sequential short-term use of a distributed set of assets, such as a fleet of bicycles or cars, by multiple users that is facilitated by a central organizing entity. Activities involving the sequential short-term use of goods and services that are facilitated through peer-to-peer (P2P) marketplaces. This definition and the associated image where inspired by work commissioned from the Mowat Centre by CSA Group. See Ditta, S. Thirgood, J. and Urban, M. 2017. The Rise of the Sharing Economy: Exploring standards-based solutions in a changing marketplace. The Mowat Centre ; CSA Group. https://mowatcentre.ca/the-rise-of-the-sharing-economy/. Much of the sharing economy consists of “peer-to-peer” (P2P) interactions and transactions which take place on networks that are distinguished by their lack of a central node. For example, instead of multiple providers selling to a central intermediary who then sells to multiple consumers, individual “peers” buy and sell directly to and from each other. Increasingly, this P2P activity is facilitated by online platforms. In addition to acting as a focal point around which providers and consumers congregate, these platforms also often add value by providing marketplace supporting services such as insuring transactions and emergency assistance. Firms that operate in the sharing economy tend to rely heavily on reputational mechanisms, with user reviews and rating systems being the most common examples. 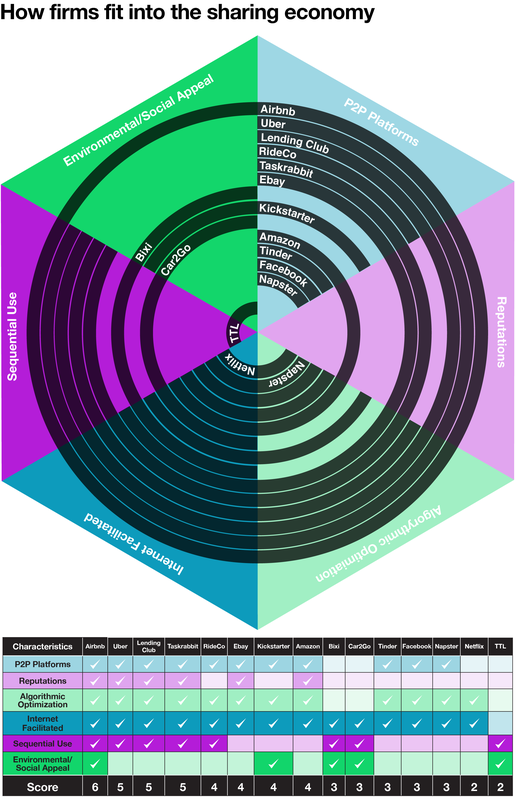 These mechanisms – which platforms often encourage consumers and providers to use – are meant to generate a sense of trust between users, and to act as a market-based form of quality control. If a user receives multiple poor reviews, other users may decline to do business with them; in extreme cases, users can even be banned from a platform. One of the novel aspects of the digital economy is the extent to which it involves the use of sophisticated algorithms for a variety of purposes, ranging from matching individuals looking for a date to offering product recommendations. The benefit of these algorithms is that they can reduce transaction costs in two ways. First, they enable coordination of joint activities that might not otherwise have been possible – such as creating convenient shared rides for anonymous strangers. Second, they facilitate the discovery of providers or products by consumers within massive and difficult-to-navigate online marketplaces. This is especially valuable for P2P marketplaces. Instead of multiple providers selling to a central intermediary who then sells to multiple consumers, individual “peers” buy and sell directly to and from each other. While P2P transactions are not new (e.g. car-pooling), the Internet makes arranging such transactions much easier, and has enabled providers of these services to expand rapidly. The advent of the mobile Internet has further boosted this growth by allowing greater sensitivity to time, location and proximity. This has, in turn, enabled new business models – which previously would have been insufficiently agile or convenient – to become viable. A critical feature of the sharing economy is the sequential use of assets (like cars or rental properties) by multiple users. Indeed, the sharing economy often refers to the shared use of a single asset by a number of users in sequence. Such sharing enables individuals to substitute access to an asset for ownership. There are two main ways to do so: a P2P model, in which peers rent their own assets to each other, or a fleet model, in which a single provider rents fleets of assets out to the market. Attempts to create positive environmental and social impacts played an important role in the origin of the sharing economy. These values also persist in many initiatives, such as tool and seed libraries, that are still commonly perceived as a part of the sharing economy. Many individuals’ participation in the sharing economy is still motivated by perceptions of the environmental and social value of the shared use of products and services. As demonstrated in the infographic, there’s a lot of diversity among sharing economy firms, and no clear dividing line to cleanly separate activities that are clearly part of the sharing economy from ones that are not. Nonetheless, firms that are central to the public’s conception of the sharing economy, such as Uber and Airbnb, score the highest under our definition. Other digital companies, such as Facebook and Netflix, which share some sharing economy characteristics but are not generally viewed as sharing economy firms, receive predictably lower scores. Additionally, however, a number of firms possess a middling number of these characteristics. Businesses such as Bixi and Car2Go (often cited as sharing economy firms) and firms like eBay and Amazon (which are not) all score similarly. The fact that the Toronto Tool Library only possesses two of these characteristics, yet is arguably the most faithful to the original ideals of the sharing economy, further underlines the challenge of defining this evolving phenomenon. Ultimately, a straightforward definition that decisively maps out the boundaries of the sharing economy may not be possible simply because the term means different things to different people and because the sector – and the technologies which have enabled it – continue to evolve rapidly. Nonetheless, given the widespread interest in the “sharing economy”, this is a term we’ll likely have to learn to live with. By providing a clear definition, a set of interpretive criteria and a transparent scoring system open to adjustment by the user, we believe that the approach presented here offers a good combination of rigour and flexibility. As policymakers continue to tackle the challenges – and leverage the opportunities – that the sharing economy presents, we hope this approach can help advance clear thinking and support good policy development in this area.